Give Customers a Night to Remember with a Prize Wheel! Imagine walking into your favorite bar; the lights are dimmed, the music is thumping in your chest, and your favorite bartender is already waiting with an ice cold glass and a smile. The night is young and anything can happen. Part of the appeal is the unknown as the whisper of “you only live once” echoes through the crowd. As the owner, you strive to show customers the time of their life and hope that the experience isn’t a one-time affair. You’re giving them something unique each night, and they don’t know what kind of amazing adventures they might undergo before dawn. Your bartender is not only being paid to make cocktails, but also to make an atmosphere that will lure them back again and again. What better way to keep customers guessing than to have one of our Dry Erase Prize Wheels on your wall. 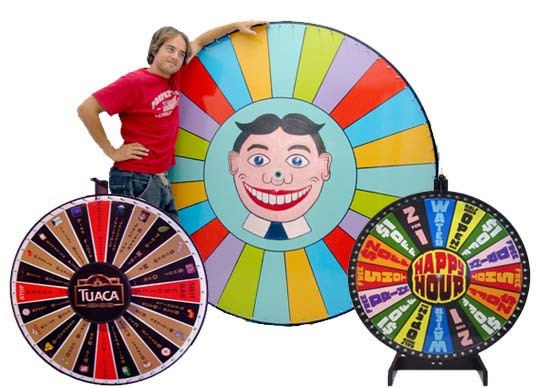 These dry erase prize wheels are so versatile that you can use them for all of your demographics, and have the freedom to change prizes or drinks as often as you want. You can write in fun bar games, offer discounts, or fill in the sections with different drinks and give a “bartender’s special” on the winning slot for a period of time. Run out of a certain brand? No worries! The marker can be easily erased and replaced with something else so that no customer is disappointed! Or better still; hold off on the more expensive winnings until the end of the night to ensure that customers stay until closing. End the night with a half an hour of open bar or Customer’s Choice. On the Dry Erase prize wheel we also include custom graphics that can incorporate business logos so that everyone visiting your display remembers who had that great game and gave away the best prizes. This entry was posted in Uncategorized on January 30, 2013 by spinningDesigns. Don’t forget to play! Get your game on! Have some fun already! Just Play! Every state has their own lottery slogan. What better way to compliment one game is to add another? It doesn’t matter how many super storms rage through, how deep our financial depression goes, or how high unemployment rises, people will still dig their hands in their pockets and find opportunity in a few singles. One of the best ways to guarantee and even boost sales is to buy our Lottery Wheels. What better way to keep customers happy than to offer then another shot at winning on one of our custom wheels? 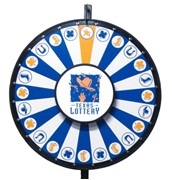 A custom lottery wheel from SpinningDesigns.com is a great way to boost business! It can say the particular lottery in the center or even a store logo on a stationary logo plate, giving your game a touch of your business’s personal flavor and showing off State Pride! State Lotteries all over the country are catching on to this idea. Sales are rising and customers are flocking to those particular stores who carry these lottery wheels. Let’s face it, people who buy lottery tickets know better than to pass up this chance. Who knows; maybe we’ll start seeing flyers for “Spinners Anonymous” soon! You never know! This entry was posted in Uncategorized and tagged game wheel, lottery wheel on January 16, 2013 by spinningDesigns. Every man deserves his own space; a place he can do up and not have to worry about the repercussions of his girlfriend, wife or mother and their female ideas as to what interior design would work best. Over the last few years, the items that men put in their cave have become more and more extravagant from kegs and big screens to deer heads and putting greens. Time to raise the stakes. Why not get something the boys will be jealous over for years to come? Add a Prize Wheel to the list of those masculine accessories and see how boy’s night out turns into boy’s night in. Let’s beef up that card game with one of our Game Wheels, including Lottery Wheels, Dice Wheels and Roulette Wheels, guaranteed to take it up a notch from the other guy’s boring card table. 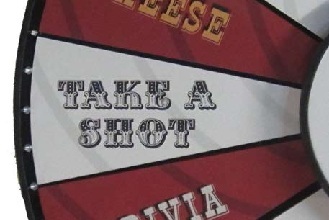 Take a shot with a prize wheel for your man cave. Do you and your buddies spend time at the bar in your mantuary? Imagine you’re very own shot wheel right on the wall. Did your buddy lose a bet? Spin the wheel and see what poison he’ll drink next or what punishment he will have to endure. Custom or not, we can make your wheel Dry Erase so you can change anything instantly. Have an idea of your own? Want a spinning dart board or a custom design of your friend’s faces? Not a problem! You will work hand in hand with our graphic designers to ensure it’s exactly what you want. Because you’re the man, and what you say goes when it comes to your designs. This entry was posted in Uncategorized on January 11, 2013 by spinningDesigns.